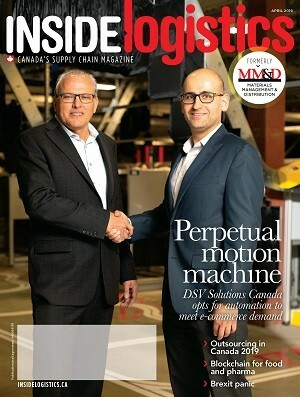 Intelligrated featured its computerized maintenance management software (CMMS) designed for material handling systems. Known as the Intelligrated Reliability Intelligence Solution (IRIS), the software comes with implementation support, OEM maintenance expertise and a pool of relevant, reliable data. IRIS collects and analyzes system data to help plan and execute an effective preventive lifecycle maintenance program. The software can create work orders and daily maintenance schedules, maintain accurate inventory of spare parts and automatically place orders for necessary replacements and improve budgeting, reporting and tracking of key performance indicators. This helps facilitate regulatory compliance, improves lifecycle productivity and increases uptime with reduced overtime and paperwork. IRIS uses a software platform from Maintenance Connection, a technological leader in CMMS solutions. The Big Joe walkie reach truck. Big Lift LLC believes that due to the proliferation of small store formats and the growth of e-commerce, strains to traditional fulfillment operations are occurring that require new innovative products like the J2 Joey and PDSR it showed at MODEX. “Whether at a store location, cross-dock, warehouse or in-between; new equipment is needed that is simple, capable and intuitive to operate, which is exactly what we are developing,” said Bill Pedriana, director of sales for Big Lift LLC. The Big Joe PDSR is an AC-powered vehicle with a 3,000-lb capacity and lift heights available up to 157 inches. Standard equipment includes power steering, side-shift, integral tilt, and standard proportional controls for lift, lower, reach and retract. Options for the vehicle include several straddle and wheel options as well as a choice of three masts, a 106-inch and 126-inch two-stage, and a 157-inch triple. The Big Joe J2 Joey low-level order picker features a 2,000-lb total vehicle capacity and the ability to lift 1,500-lb pallets up to 72 inches. The J2 Joey has power steering, an ergonomic mini-mast, and an industrial battery compartment as standard. Optional equipment includes a choice of guard-rail-mounted or front-mounted controls based on application needs and an overhead guard upon request. Barcoding, Inc provided hands-on, live demonstrations of Bluetooth Low Energy (BLE) asset beacons at its booth. By participating in Barcoding’s “Pick to Pose” demonstration, Modex attendees were able to see how asset beacons enable “pick to light” processes. Using BLE, asset beacons allow enterprises to track physical inventory in near-real time by turning assets into tiny sensors. These sensors continuously transmit information about each item’s presence, temperature and movement so that users know the exact location of their inventory. Attendees found several mystery boxes, each containing a hat to wear in Barcoding’s photo booth. Using Barcoding’s mobile application, participants selected one of the boxes. The beacon on the corresponding box then lit up, guiding the attendee to their hat. Finally, the participant snapped a selfie wearing the hat inside the photo booth. The photo gained you admission to Barcoding’s #SupplyChainGeek Mix and Mingle on Tuesday, April 5. “Barcoding’s Modex booth is no ordinary tradeshow booth—it is a launching pad to efficiency, accuracy, and connectivity,” said Jay Steinmetz, CEO, Barcoding, Inc.
Caljan Rite-Hite talked about “future-proofing” your operations by investing in adaptable equipment. As an example, they demonstrated their Performer Telescopic Conveyor. This conveyor is designed to evolve as requirements change. It has a Universal Multi-Connector that allows the specs to be updated even years after the equipment was installed on-site. The company says the Caljan Performer is not only the longest telescopic conveyor available today, it is the strongest. Changing the direction of the belt makes a loading conveyor into a conveyor that can be used for unloading—or both loading and unloading. If you want the conveyor to serve multiple doors, a traversing system can be fitted enabling the whole conveyor to move between doors at the press of a button. A vacuum-driven lifting aid, ventilation, heating, lighting etc. can be added to the Telescopic Conveyor to improve the work environment for employees handling loose-loaded cargo. Even larger options, such as an operator platform lifting one or two operators up to a comfortable working height inside the container or truck, can be added. All updates–minor or major–can be carried out on site. Storax America | Flexspace showed high-density, mobile, industrial storage solutions aimed at: increasing storage capacity; increasing accessibility and productivity; while decreasing the facility footprint. Poweracks, the industrial mobile racking system, comprises a racking superstructure installed to a powered, moving base. Poweracks replaces conventional static aisles with one moving access aisle. This unique design combines direct access with a substantial increase in storage density. The Ranger is a high-density storage solution that automatically circulates pallets on a shuttle system by handheld remote control or a WiFi PDA device. Utilizing photocell technology, the Ranger detects and positions itself underneath a pallet, delivering and extracting pallets with a tunnel system. Automation Plus, a division of CSF Incorporated, has invented a new way to handle pallets, called the Pallet Return Device (PRD). The PRD is designed to operate in distribution centre pick modules and makes handling pallets (wood or plastic) safer and more efficient than current practices. As a bonus, it works without using any outside energy source such as electricity or compressed air. Currently, stacking pallets requires expensive machinery or intense manual labour (movements prone to cause injury). The PRD operator lifts the pallet over a pivot point, creating a mechanical advantage to prevent the back strain associated with lifting pallets. The PRD’ has a “carriage” to help guide the empty pallets. This feature produces a perfect stack every time, eliminating the need for the fork truck driver to waste time reshaping the stack. Additionally, pallets stacked neatly one atop the other removes the hazard associated with falling pallets. A single pallet can weight anywhere from 30 to 70 pounds. The PRD incorporates a shock-absorbing device that provides a smooth transition from the load position to the unload position. In use, the operator loads the carriage. When the carriage is full, the operator simply releases the load, and lets the shock-absorbing device safely guide the stack to a vertical (unload) position. Once positioned, the pallets are rolled forward to a raised outbound location which releases them from the carriage. The operator then slides the carriage back, tilts it to the load position, and it’s ready to receive more empty pallets. The Raymond Corporation unveiled a new line of polyurethane wheels and tires formulated for lift trucks running at optimum levels. The new wheels and tires include: Raymond Smoothy premium steer and drive tires and load wheels; Raymond UltraRide premium steer and drive tires; and Raymond Preferred steer and drive tires and load wheels. “Raymond’s end-to-end solution offerings have expanded with the new wheels and tires that fit a variety of warehouse environments and applications,” said John Perun, director of sales and marketing for the Raymond Parts division. Ideal for long- or high-speed runs with heavy loads, as well as for tight maneuvering, these wheels and tires can stand up to hard braking, and are resistant to flat-spotting. Raymond tires also have a variety of tread patterns. FOX IV Technologies has updated its TwinPrint automated packing slip/shipping label system to the Mod6 version. It prints both the shipping label and a covert packing slip onto one label. This eliminates up to 60 percent of label liner waste as well as the additional costs of separate packing slips, plastic pouches, and the labour involved in preparing the packing slip. The Mod6 has a redesigned label path, which eliminates a series of rollers, to provide easier label loading and reduction of label memory. It is also easier to calibrate, and has simplified electronics and mechanics for easier servicing and maintenance. Schmalz Inc had its box gripper for the Jumbo vacuum tube lifter on display. It’s an ergonomic aid that allows for the handling of standard small-load carriers. At an average weight of 20 kilograms per small-load carrier and 50 picks an hour, the vacuum tube lifter can transport a total load of eight tons per shift. The company also demonstrated its FXP vacuum area gripping system, which handles pieces of different shapes and sizes. Just one gripper can handle multiple pieces with a width up to 20 mm simultaneously. Because it’s lightweight, the FXP area gripper is good for use on robots. JLT Mobile Computers displayed the JLT 1214P logistics computer with what they claim is a virtually unbreakable touch screen. The touch screen makes use of the latest generation Projective Capacitive Touch (PCT) technology. The capacitive touch screen provides a user experience closer to consumer devices and is protected by a 0.07 inch thick, hardened glass cover, making scratches, scuffs or even breakage unlikely. Like resistive touch screens, JLT’s rugged PCT display can be operated with gloves in different materials and thicknesses and used in wet conditions. JLT also had its VERSO+ 10 computer with logistics dock, which it claims is the industry’s fastest rugged vehicle-mount computer. Depending on the model, the device includes either the Intel Core i5 processor or dual-core Intel D2550 processor. It has a 10-inch, sunlight-readable XGA display, and measures just 9.9 x 8.1 x 1.9 inches, including cradle. The computer can be ordered with Windows 10 (with Core i5), Windows 8.1 Industry (with D2550), Windows 7 Pro or Windows Embedded Standard 7 operating systems. Weber Packaging Solutions showcased their new BestCode Continuous Ink Jet (CIJ) Printers at the show. The BestCode has various new internal components designed with the latest technology to ensure reliable operation. The BestCode Series 8 can print best-by dates, lot codes, sell-by dates, expiration codes and other identifying marks and codes on industrial and consumer goods to ensure product traceability. The systems can print high-speed, non-contact, instantly dry marks and codes on a wide range of substrates, including plastic, glass, paper and more. Models include the 82 (1 or 2 lines of text up to 600 ft./min), the 86 (1, 2 or 3 lines of text up to 1,500 ft./min), and the 88 (1, 2, 3 or 4 lines of text up to 1,500 ft./min). Fixtureworks showed Fairlane Products rollers and bumpers. Rugged, wear-resistant and smooth, the rollers and bumpers are available in a variety of sizes, durometers, mounting options and materials. This standard product line is for machine builders and integrators who use off-the-shelf parts for their OEM designs. They can be used on conveyors, belt idlers, racks, shock cushioners, stamping die part-guides and supports, sheet metal roll feeders, carts and wagons, and more. They can also be designed into machines and assembly operations. Visitors to Ammeraal Beltech’s booth were able to explore belting solutions for a diverse range of materials handling applications. The company designs, manufactures, distributes and maintains high-quality process and conveyor belts to meet the specialist needs of nearly every major industry segment—logistics, food processing, airports and baggage handling, automotive manufacturing, textile production and more. Muller introduced the new Raptor HPL turntable wrapping machine. The Raptor HPL now incorporates Muller’s Logo Wrap enhancement that allows users to protect pallet loads while simultaneously covering the product in branded messaging. The Raptor HPL is a heavy-duty, semi-automatic turntable that can wrap up to 35 loads per hour. It can create customized wrap patterns for each unique application. In addition, patented strain gauge technology enables electronic film feed and corner compensation.